Forged irons are the hallmark of decent players, like the rubber stamp most golfers want to attain for being a decent ball striker or single figure handicapper. Soft steel forgings feel and sound better, but for many golfers it’s the subtle shaping of a forged iron we really hanker after. So for lots of golfers – and we’re not just talking single figure handicappers – the ultimate iron would combine the looks and feel of a forged blade with the playability of a cavity back. A few years ago it would have been an impossible dream, but many brands now make a forgiving forged iron. Some go at it using hollow bodies, others use tungsten weighting and titanium badges to position weight efficiently. With two of the newest forgiving forged irons hitting the shops in September (TaylorMade’s P790 and Mizuno’s MP-18 MMC, multi-material cavity) the time felt right to pit the pair in a head-to-head test to see how they differed and decide which gets the thumbs up from us. Our test pro said it’s rare to find forged irons that feel this powerful (the only other he’s hit are the Callaway Apex), so it’s no surprise the P790 (thanks partly to the 7-iron being 1.5° stronger in loft) picked up 8 yards and 3mph of ball speed. The extra distance didn’t come from a lower ball flight either; shots peaked out two yards higher, which means balls will hold a green. Ball speed protection comes from a Speed Pocket sole, and as the face is completely unsupported (where it meets the sole), face flex and rebound is maxed out, too. The crisp, straight top lines and leading edges look fantastic at address and thanks to new “SpeedFoam” injected into the internal cavity, feel and sound is fantastic. The P790s are as forgiving as TaylorMade’s M1 iron which have deep cavity backs, lots of perimeter weighting and a larger head. Mizuno are legendary when it comes to forged irons, and it's incredible to think these boast of similar levels of forgiveness as Ping's legendary Eye 2 (cavity back) iron – that's how far forgiving forged tech has come. Mizuno says a 10 handicapper should be comfortable with these in their bag. As the whole head's forged (unlike the TaylorMades, which only have forged faces) the sound and feel is duller and less explosive, much more like you'd expect of a traditional forged iron. From a slightly weaker 7-iron loft it's no surprise the MMCs couldn't quite match the TaylorMade's for all out-distance, but stacked in their favour is buckets of cosmetic beauty as well as slightly more compact short irons. Mizuno offers 16 different shaft options at no extra cost, which is a real benefit if you take the time to get properly fitted. Over the years countless golfers have swooned over forged irons and wished they were good enough to put them in play. Now, thanks to this new forging technology, there’s a good chance you are. 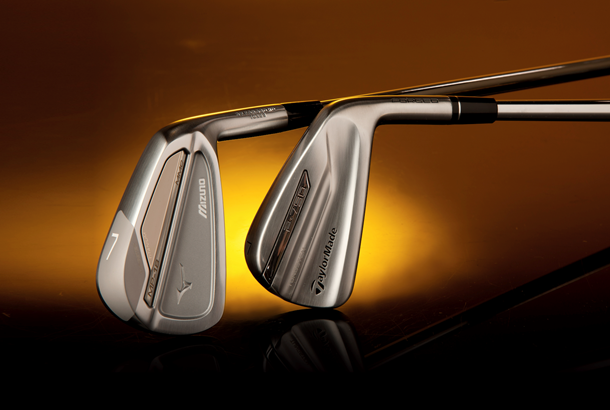 We’d say the gorgeous MP-18s could easily be used by a 10 handicapper; the P790s a 12 or 13. There are different ways to make a blade style iron playable, and we’re big fans of hollow bodies (because they feel slightly more forgiving). But whichever way you look at it forged irons have never been this playable, powerful or desirable before.